Important Note #1: This guide is definitely longer than it needs to be, but it is on purpose so that we can address as many common questions as possible, in as much detail as possible. You will likely be able to blow through many steps very fast. Important Note #2: For the purpose of brevity, we are going to assume that you are already familiar with our pricing, expected accuracy tolerances, and other general information about Canvas. If not, please check out our Help Center first. We are also assuming that you have already purchased your "Structure Sensor for Canvas" bundle (which, unless you opted otherwise, will include our Wide Vision Lens), as well as procured a compatible iPad. Important Note #3: If you purchased or are renting the Total Set-Up Package, or you're renting, go ahead and skip to Step 4! Important Note #4: Please block out 60 minutes to complete this set up process. It's often much faster than 60 minutes, but it's a good idea to build in a buffer in case anything unexpected comes up. If you have any questions or concerns, simply email support@canvas.io. There are real humans on the other side standing by to assist, and we're used to on-boarding people of all levels of technical proficiency. If there is a single piece of advice for you to take away from Getting Started with Canvas, it's this: try to run through this entire set up process one week before you intend to take Canvas on a client visit. We talk to customers all the time who unbox their sensor the morning of a customer visit, and needless to say, it can make things stressful for all parties involved. If you get everything set up in advance, not only will you save yourself the anxiety of trying to learn new technology when your client is looking over your shoulder, but you'll be better prepared to talk to them about what's happening. It's very common for our customers to tell us that their clients are absolutely amazed at what you're doing — being able to talk about what's happening will reinforce to your client that they're working with someone on the cutting-edge of technology in their field! Additionally, allowing for a 1-week buffer means that you'll have time to do a practice scan, get your CAD files back, ask questions, and for us to give you feedback on scanning technique (if any is required). We recommend reaching out to us for feedback prior to submitting your first practice order so that we can offer any necessary tips prior to making payment for your CAD files. This is not a hard and fast rule, and we always do our best to accommodate urgent timelines, but it's generally good practice. Finally, as you go through this guide, you'll be linked to documentation and articles that are both Canvas-specific as well as for general Structure Sensor users. Don't worry — Structure Sensor is simply the name of the 3D sensor, and Canvas is the name of the iPad app. 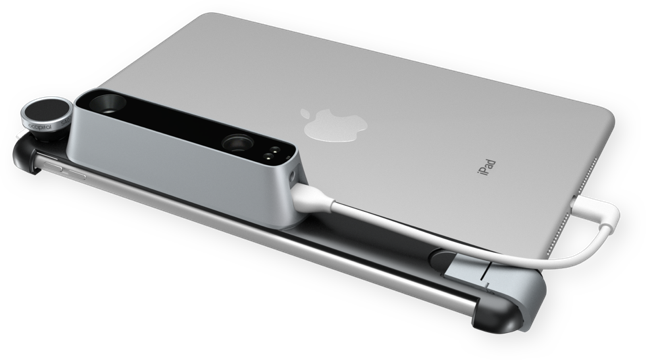 Both the hardware and software are products of Occipital, Inc., and they were literally built to work together. Before doing anything with your Structure Sensor or Canvas, you'll need to make sure your iPad is set up. You can find Apple's iPad setup instructions here: Set Up Your iPhone, iPad, or iPhone Touch. As part of this process, you will need to either create or sign in to your Apple ID. Now you're ready to get started! The first step is attaching the sensor to its bracket and connecting it to your iPad. Finally, after your Structure Sensor is securely attached to your iPad, screw in your Wide Vision Lens. The three prongs should match up with the notches around the lens to help guide you. Next, you'll want to head to the App Store on your iPad, and download the 3 main apps related to using Canvas. "Structure" app (free) - this app is not strictly required to get started with Canvas but is important for downloading firmware updates for your Structure Sensor, and we recommend downloading it during setup simply so you don't forget later. You can tap any of these links on your iPad to be directed to App Store directly. This will ensure you download the right app, as there are several with similar names. No need to spend time learning the interface for these apps yet - we'll cover that later! Now that you have all the right apps downloaded, it's time to calibrate your Structure Sensor to your iPad. This is an important step that aligns what your iPad camera sees with what Structure Sensor sees, and without it, we can't reconstruct the space in 3D. Calibration can sometimes look a little foreign and intimidating if you've never done it before, but don't worry — you generally only need to do this once (and on the rare occasion that a software update requires it, which you'll be notified of in the app). If you intend to scan with our Wide Vision Lens (which comes with Canvas by default, make sure you calibrate with the lens on. Some customers prefer to calibrate for use both with and without the lens (in case they lose the lens), but you only need to calibrate for the setting you'll be scanning in. Calibrating the Wide Vision Lens involves moving your iPad around this checkerboard pattern, and it is much easier to do so if you can print it out and put it on a flat wall (though you can use your computer screen if you're in a pinch). In particular, please pay attention to the bracket alignment step starting at 1:54. It is not uncommon for first-time users to skip this step or do it haphazardly, and this can lead to less precise results. It's not going to kill you and make your scans impossible to convert, but it can make the difference between fine vs. ideal accuracy. 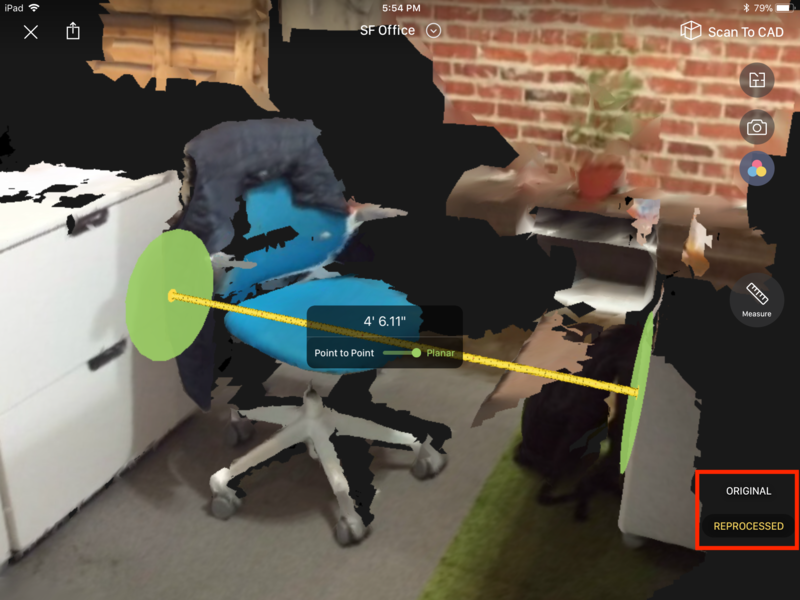 Pro Tip #1: You can quickly and easily verify that you've done this precisely by finding a hard edge like a table or desk, and looking at the depth overlay on top of the camera image from different angles. From each angle, the "shadow" of the depth overlay should be fairly small. Pro Tip #2: As this is a totally new thing for most of our customers, it's totally normal to be a little uncertain about whether or not you did everything right. We totally understand this and are happy to review an initial scan for free to verify correct calibration (as well as scanning technique). Please read on for more details. You may also desire to set up email, texting, iCloud and other services right away, or you can skip it. We recommend browsing through other iPad settings to make sure it is set up according to your preferences, as we have turned off everything by default. Structure Sensor Calibrator - this is the app you will use to calibrate your sensor to your iPad. This step is already completed for you, but may be required again for rare software updates. We leave this step to you to ensure you get the latest app updates automatically, on your own Apple ID. Make sure to type in the exact name to make sure you get the right app, but in the case of Structure you may want to add "Occipital" since it is a common name. Important tip for all customers: Do not rename the iPad. Structure Sensor's calibration is associated with the name of your iPad and its unique identifier. If you rename the iPad, that link will be broken, and you will need to recalibrate again (See Step 3). For buyers: Please note that your iPad does not come with Apple Care, but you are eligible to purchase it from Apple directly for a limited time by entering your iPad serial number here and following the prompts on-screen. If you are interested in adding Apple Care to your iPad, we recommend doing so within one week of receipt. For renters: You really only need to download Canvas, but you may wish to download these other apps in the rare case that we need you to debug or recalibrate. You may also want to download other apps from the Structure Sensor App Gallery to experiment with other uses for Structure Sensor. If you have any questions about this step or see anything odd with the way the iPad is setup, don't hesitate to email support@canvas.io. This is a brand new service we are offering, so please feel encouraged to share any feedback or suggestions about your experience. Go to the corner of the room you wish to scan, start about 1-2m away from the wall, and press "Scan" to begin capturing the space. Follow the best practices outlined in the video below and when you have completed your scan, press "Done". If it doesn't, or you just want an expert to reassure you that you did everything correctly, simply email support@canvas.io. We'll tell you how to submit a scan for review, and we'll coach you on any issues we spot so that they're caught before you take Canvas to a customer site. This is a free service we offer all first-time Canvas customers, as it will save us both time later! 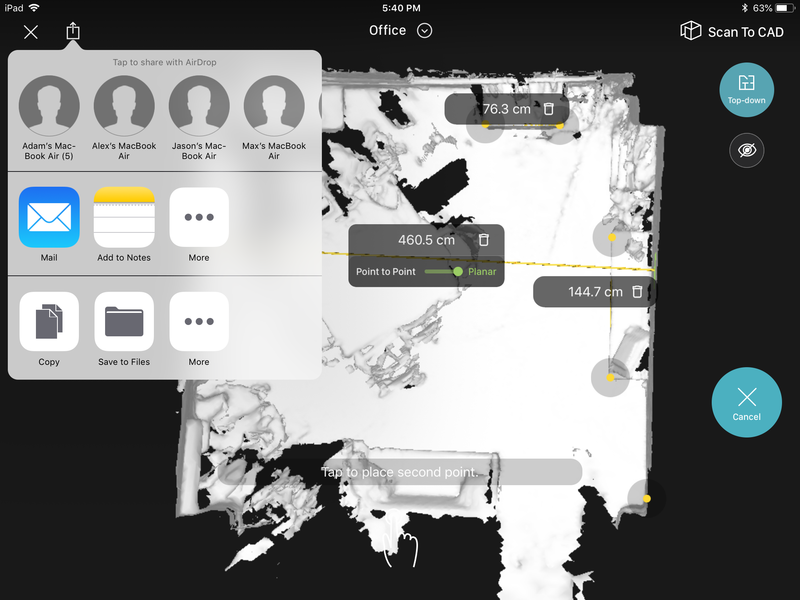 Your 3D model is saved on your iPad, so you can go back and revisit any space, at any time. Whether you just need to refresh your memory of a given viewpoint or capture a forgotten measurement, you're never more than a few taps away. To extract a measurement from the space, simply open the scan and tap the "Measure" button. You can also share the scan as a .obj file via email or Airdrop. However, the real power in Canvas for many customers comes from the "Scan To CAD" service. With Scan To CAD, you simply upload your 3D scan, and within approximately two business days you'll get back an editable, professional-grade CAD file in industry-standard formats (more on this here). You can read more about Scan To CAD here. This service is available starting at $15 per scan, and it is what really allows you to "skip ahead" to the fun part: design! You can learn more about Scan To CAD here, or see a sample output below. This reprocessed scan is typically available within a couple hours of upload, and you can access it by tapping the "Reprocessed" button in the bottom-right corner of the scan screen. For more information on merging scans, please read: Can I merge multiple scans to cover an entire property? You may also want to read: How big of a space can I scan? At this point, everyone's workflow becomes different. Some customers train a junior employee or assistant on how to scan so that they can spend more time with their client, whereas others prefer to (or have to) own the process from beginning to end. With the time saved with Canvas, some customers choose to take on more projects at once, whereas others simply accelerate their existing projects (by parallelizing steps that used to have to be done sequentially). Finally, some customers take their 3D model all the way through design, final visualization and even construction (modifying the same file along the way), whereas for others the model is the end-goal in it of itself. If you have questions about how Canvas can be applied to your specific use case, just reach out to support@canvas.io. If it has to do with the home, we've almost definitely seen someone use Canvas for a similar job, and we're always happy to trade notes on what we've seen work well as well as what tends not to work well. Lastly, every space is different, so as you encounter new kinds of environments to capture, it's totally normal to have additional questions. As always, we're standing by to help at support@canvas.io. That's all! 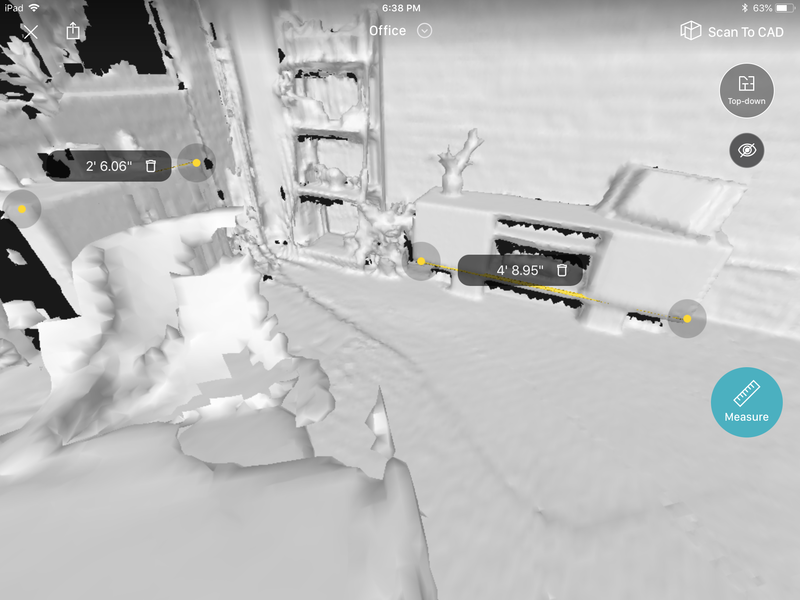 You're ready to conquer the world, one 3D scanned home at a time. Important final piece of advice: after going through this process, you should charge both your iPad and your sensor before taking it out to a customer site. Your sensor has 3-4 hours of active scanning battery life, so you should still have plenty of battery after this process, but it's always better to be safe than sorry! In general, it's a good idea to charge both your iPad and sensor back up to 100% in between site visits. If you're still in a reading mood, these are a few common additional resources we share with new customers. I'm totally new to 3D. Do you offer any training in design programs that pair well with Canvas? Working with Canvas - for larger companies, resellers, offering scanning as a service, etc. Structure Sensor App Gallery - there are over 90+ other apps made for your new Structure Sensor!